● ● ● ● ● ● ● ● trends FUNCTIONAL MENU MENTIONS ● Chill-latte infused with CBD oil and CBD-enhanced tonic juices at the Green Goddess Café in Stowe, Vt. ● CBD add-on for smoothies at Harlow restaurant in Portland, Ore. ● CBD elixir with turmeric and ashwa- gandha, an herb touted for its stress- reducing properties, at Juice Crafters in Los Angeles. Source: Consultancy Baum + Whiteman's 2019 Food and Beverage Trends Report Booth 1257 ENGINEERED for EXCELLENCE From our award-winning high-production energy-efficient fryer, to our innovative char-broiler designs, Royal has all the high-quality cooking equipment you need for your kitchen. 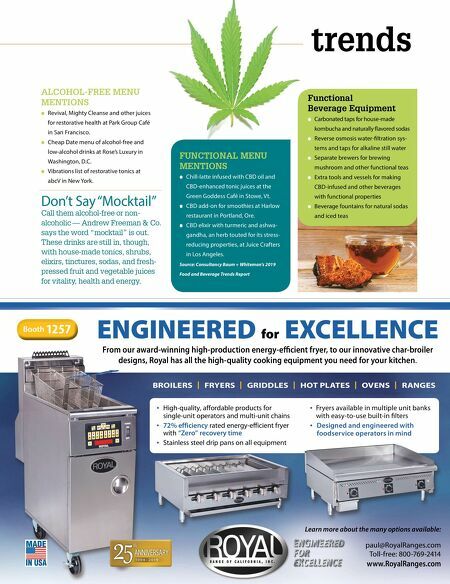 Learn more about the many options available : paul@RoyalRanges.com Toll-free: 800-769-2414 www.RoyalRanges.com • High-quality, affordable products for single-unit operators and multi-unit chains • 72% efficiency rated energy-efficient fryer with "Zero" recovery time • Stainless steel drip pans on all equipment • Fryers available in multiple unit banks with easy-to-use built-in filters • Designed and engineered with foodservice operators in mind broilers | fryers | griddles | hot plates | ovens | ranges Functional Beverage Equipment ● Carbonated taps for house-made kombucha and naturally flavored sodas ● Reverse osmosis water-filtration sys- tems and taps for alkaline still water ● Separate brewers for brewing mushroom and other functional teas ● Extra tools and vessels for making CBD-infused and other beverages with functional properties ● Beverage fountains for natural sodas and iced teas Don't Say "Mocktail" Call them alcohol-free or non- alcoholic — Andrew Freeman & Co. says the word "mocktail" is out. These drinks are still in, though, with house-made tonics, shrubs, elixirs, tinctures, sodas, and fresh- pressed fruit and vegetable juices for vitality, health and energy. ALCOHOL-FREE MENU MENTIONS ● Revival, Mighty Cleanse and other juices for restorative health at Park Group Café in San Francisco. ● Cheap Date menu of alcohol-free and low-alcohol drinks at Rose's Luxury in Washington, D.C. ● Vibrations list of restorative tonics at abcV in New York.